Here you can discuss anything related to the series. The A's movie comes out on Blu-ray in March. Ah, I've been wondering when the A's movie would come out. Thanks for that info. Only finished watching each of the anime series 2 months ago. I thought they were each outstanding but StrikerS was by far my favourite series. Thinking of reading the Mangas now, particularly Vivid, as it's just more Nanoha. "Live for today, but look forward to tomorrow, and don't forget to smile." The Greatest Anime Music Playlist!... or it will be someday. The Vivid tranlations are slow and very far behind. I don't even care about Force. The supplemental manga are all finished and worth reading. Make sure you watch the movie too, it's amazing. You sure love your magical girls don't you? Anyway, I'm on the second season at the moment. It feels slow, but I enjoy it. Desdenova wrote: The Vivid tranlations are slow and very far behind. That's always the way for mangas you want to read ain't it? I do intend to watch the movies but since they're alternate re-tellings of the same story i want to put a bit more distance between when i watched the series before i do so (i made the mistake of watching Clannad's movie and series close together and it didn't work out too well). Sir Maddy wrote: You sure love your magical girls don't you? The second series is probably the worst of the three imo. Still really good just lacking in something that the other two aren't. I've been told StrikerS is the worst one. Because apparently the MC is very boring. Sir Maddy wrote: I've been told StrikerS is the worst one. Nanoha and Fate still play MC roles, you've just got two additional ones (well maybe one technically). It's actually an odd one really cause no one character dominates enough to be called THE main character, imo, you're pretty much rooting for the whole cast to achieve what they're trying to achieve (well except for the antagonists of course). But it's all a matter of opinion really. I think i like it better than the second on the basis of the story being better imo, also the fact that it's the longest of the three giving you more time to explore the (much larger) cast is a massive bonus to it as well. You'll have to sit down and watch it yourself to make up your own mind about whether it's better or worse for whatever reason. I don't think they'll ever dub StrikerS. Yeah... you could be waiting forever on that one. That's why i always check whether every series of an anime are dubbed before starting watching one in dub, otherwise you do come across that problem of waiting around or missing out (or if you're desperate going thru the jarring experience of going from dub into sub). The A's movie BD is out there. BlurredExistence wrote: Yeah... you could be waiting forever on that one. That's why i always check whether every series of an anime are dubbed before starting watching one in dub, otherwise you do come across that problem of waiting around or missing out (or if you're desperate going thru the jarring experience of going from dub into sub). I'll admit it can be hard at first but with practice it won't take you long before you can not only do both at the same time but you'll also stop noticing that you're reading subs. I really wish you the best with that man! Being able to watch subs does open up a whole world of anime that you wouldn't have been able to watch before. The A's movie had a lot of changes and wasn't quite as good as the first movie. I liked seeing Reinforce again. I'd pay to see this crossover happen. They both did Magical Girl Anime right, even if one was a lot better. Fun Fact: Did you know Urobochi said once in an interview that Madoka was inspired by Nanoha. I think that would be rather awesome! Which way would you cross it over tho? 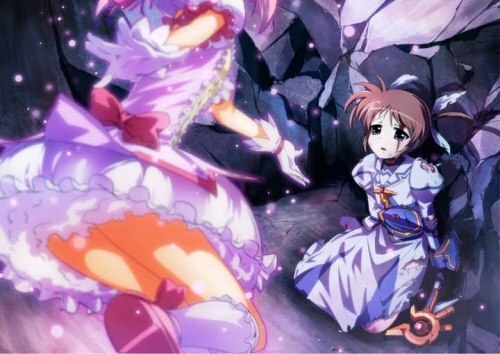 Madoka in Nanoha's World or Nanoha in Madoka's? We're getting a third film. Fun Fact: The movies are in-universe productions. And the 3rd movie isn't Strikers. Nope it's going to be original content. Which means it's possibly going to show events from A's to StrikerS. I would be very okay with that. We'd all be very okay with that. I would love to see the events between A's and StrikerS.